by Byron Bixler There are several places one could start when addressing the individual parts of Pablo Larrain’s masterpiece, but let’s begin on its most superficial level. Jackie belongs to a group of “snapshot biopics” that have come out in the last few years, catching up with a historical figure during a very brief period of time — in this case, it is one of the most tumultuous weeks in American history. The bulk of the story takes place in November of 1963. A president is murdered and a first lady is left to arrange a funeral and decide what the rest of her life will be. In this category of “snapshot biopics,” the film carves out a niche of its own, serving as a detailed historical document, a rich character study and a rumination on abstract feelings all at once. The dramatic potential is massive when it comes to this specific subject, as choice of perspective is crucial. We’ve seen numerous films in which the Kennedy assassination is seen through the eyes of a third party — an unavoidable emotional beat in an ordinary citizen’s story. JFK picked apart the circumstances of the event and the shady figures possibly lurking behind it. Parkland observed that moment from the perspective of doctors trying to save the president. But Jackie concerns the First Lady, an often sidelined figure, but the person who was emotionally and physically closest to what happened. Jackie Kennedy was a point of national fascination and something of an enigma – a kind of celebrity who was widely admired and desired. Rising to prominence in a time when television played an increasingly important role in politics, she was very much a public figure, but her private life was shrouded in mystery, and as a Kennedy by marriage, she was something of an outsider to her extended family. On its face, Jackie tells the story of a historical figure violently confronted by grief and trying to deal with the whirlwind of events surrounding her. The Kennedy assassination has become one of the defining moments in 20th century America. Countless books have been penned about its details and repercussions, “what-if” scenarios abound, and controversy engulfs it. It is truly one of the few “where were you when…” events and it commands a certain aura that historians, storytellers and, really, most Americans are drawn to. 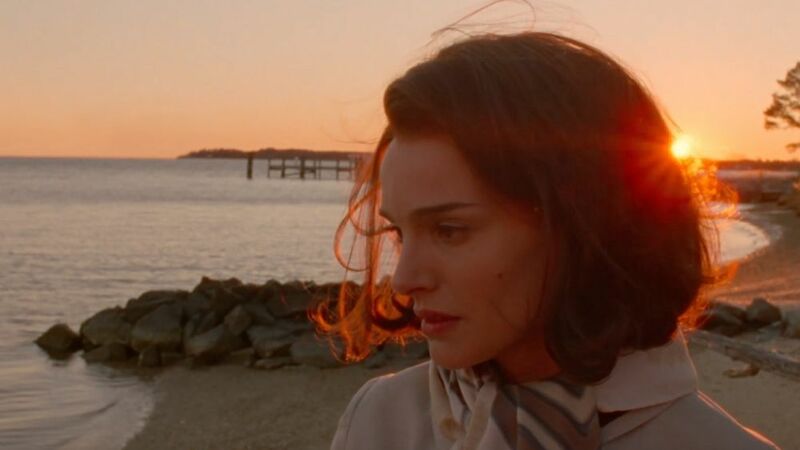 For the first third, the film is about Jackie’s emotional isolation, her wariness of the press, and consternation over how her husband is posthumously portrayed. Sitting down with a reporter (Billy Crudup) a matter of weeks after the assassination, she is reluctant to say anything, occasionally revealing some small revelation, but always quick to take it back; sternly striking it from the record. We see her in the immediate aftermath of the shooting — in shock, spattered with brain matter that has yet to fully dry, grasping for anyone who can commiserate with the horror she’s just experienced. She speaks to anyone who will listen, catatonically repeating what she saw — the mist of blood, the flying skull fragments, his open eyes. Of course, no one can truly identify with her. In this 24-hour period, nothing else exists. The autopsy takes place and LBJ is sworn into office, but the First Lady’s mind is in a hurricane of confusion, resentment and immense sadness. As the film goes on, we get an increasingly intricate web of feelings and ideas, memories and myth-making. Aspirations toward solidifying a legacy come into play, the line separating one’s carefully crafted public image from their most intimate thoughts and reservations is addressed, and in the swirling particles making up the grieving process, deeper existential questions arise. Noah Oppenheim’s script is astonishing in its balance and evocation of these elements, opting for subtlety over sensationalism, but never being so minimalist that it misses placing key bits of emotional or thematic punctuation. The conversations are just as engrossing as the quieter stretches of pained reflection. Additionally, a major theme that works its way through the film concerns the line dividing one’s private identity from the public persona constructed for the world to take in. The film is bookended by a strikingly meticulous recreation of Jackie Kennedy’s televised White House tour. These two flashbacks fit in nicely with the film’s non-linear structure and deftly convey the character’s permeating sense of discomfort in her much-scrutinized role. At different moments, the film evokes fairy tales and fantasy as well, thus extending the concept of public and personal identities to apply to the intricacies of a national consciousness and the tendency for history to be romanticized, softened, crafted to fit a certain narrative. Larrain’s direction is magnificent – restrained and stately at times, yet achingly expressive as well. His direction of flashback conversations is especially notable, as he often repositions his actors at multiple points in a scene through sparsely placed jump-cuts. This decision never feels intrusive and it adds a touch of the surreal, slyly hinting at the imprecise nature of memory. The atmosphere is cold, the color palette is muted and — thanks in large part to Mica Levi’s haunting score — an alluring eeriness hangs over the picture. Seeing Darren Aronofsky credited as a producer at the end explains a lot, as the film represents a unique cross-section of raw emotion, psychological distress and aesthetic refinement that gives off slight notes of Black Swan. More than any other film, though, the experience of watching Jackie reminded me of Foxcatcher in its quiet surface concealing several undercurrents of discomfort and impending doom. That “doom” in Jackie would, of course, be the assassination itself, which we don’t see until near the end. And when it finally does play out, it’s quick, visceral and extremely upsetting. 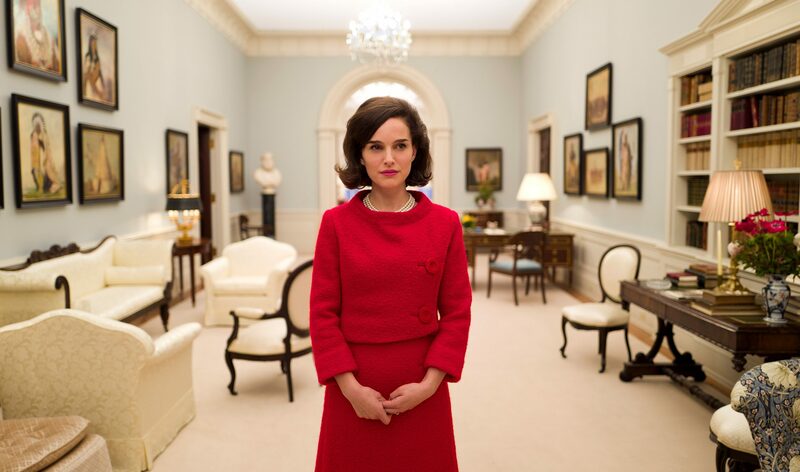 Regarding Natalie Portman as Jackie Kennedy, her performance is towering in what it accomplishes. She certainly doesn’t resemble Jackie, and it takes a few minutes to get used to her breathy manner of speaking, but Portman’s ability to portray the soul and underlying discomfort of Jackie is absolutely amazing. With the slightest tweaks in her facial expressions and her frequently strained tone of voice, we get all the agony and frustration of the character. Whether she is interrogating the notion of a loving god, questioning the self-serving nature of her motives, or trying to stress JFK’s importance to her (on a personal level) as well as to the nation (as a symbol), Portman is thoroughly engrossing, and at times painful to watch in her raw expressions of grief. As the film steadily marches toward its conclusion, one gradually gets the feeling that they are seeing something massive. I struggle to think of another American political biopic that feels as effectively intimate, insightful and intricately psychological as this does. Bottling a singular moment in time with a singular directorial vision, Jackie tastefully and intelligently navigates a chapter of American legend. Truly one for the ages.